Much has been said, lately, about the BMW 5 Series and its competitors. Many believe that the 5 Series is the best all around car in its class. Many also believe that the Mercedes-Benz E-Class is the more luxurious car, therefor better. There are also those that believe the Jaguar XF is the more dynamic car, making it the best choice. However, most customers don’t look at stuff like that. Most customers look at how much tech is has, what sort of options they can get and, more importantly, how safe it is. Safety might make some enthusiasts yawn but it’s something extremely important to most customers, especially those with families. So when the BMW 5 Series earns the highest possible grade from the IIHS, it will certainly convince some customers to buy. According to the IIHS (Insurance Institute for Highway Safety), the highest possible grade is the coveted “Top Safety Pick+”. To earn this grade, a car must score “good ratings in the five crashworthiness tests, an advanced or superior rating for front crash prevention and an acceptable or good headlight rating.” The new G30-generation BMW 5 Series nails all of those criteria and earns itself the Top Safety Pick+ grade. One of the most important aspects of the IIHS’ tests is the front overlap crash test. Basically, if a car hits an object head-on but only connects on the outer edge of the front end, it will do the most damage, as there’s the least amount of structure there to lessen the impact. So the IIHS developed two tests, the “Small Overlap Front” and “Moderate Overlap Front”. The BMW 5 Series scored a “Good” rating in both, the highest rating possible. 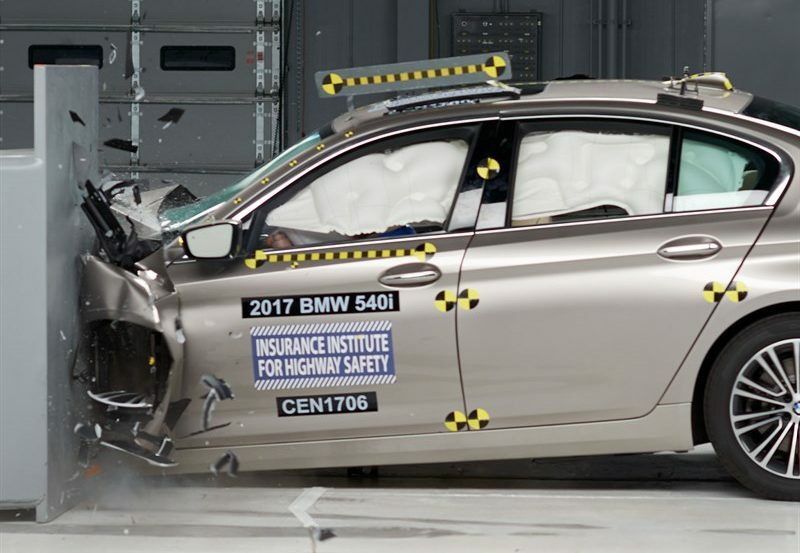 You can see the video of the small overlap front test below and watch as the 5 Series simply deflects the damage outward and pushes the car away from the impact, lessening the blow to the passengers. This is, of course, by design, as the front end is designed with crumple zones to deflect the energy out and away from the passengers in the event of an overlap crash. 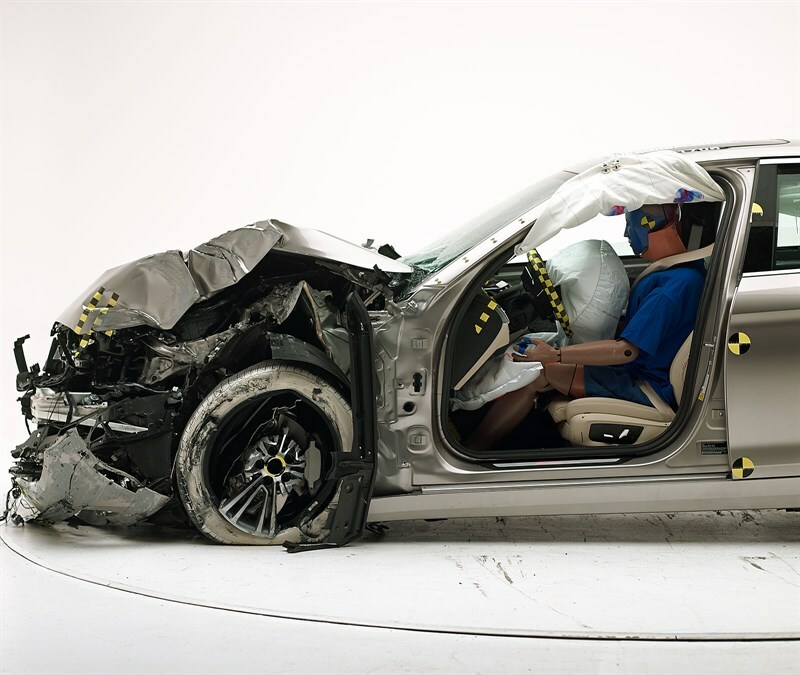 In the video, you can also see that the passenger dummy is completely enveloped in airbags before it even moves from the impact, keeping it completely safe. I don’t know about you but watching crash testing always bums me out. There’s something so violent and cringe-inducing about watching a car crash, listening to the metal crumple and the airbags deploy, as if you know these are designed to attempt to prevent death. However, watching it in slow motion and you see that the dummy really looks okay in there. Admittedly, there are many modern cars that are this safe, it’s not just the 5 Series, but it’s nice to know that it’s one of them.